Can Your PC Start Up Faster? … a major part of its sequence of actions is to load programs and services that are configured to open with the Windows operating system. Once these startup tasks finish loading, the PC is ready to use. Windows services that are automatically configured to start based on a default operating system configuration, but do not apply to the intended use of the computer. Pre‐installed software with startup commands pre‐loaded; some of these programs may be unwanted or unused by users. Installed software that automatically adds commands to startup. Users may or may not want these programs to automatically launch at startup, but many program installations don’t give an option. Free downloaded programs bundled with third‐party applications that are configured to automatically add themselves to startup, unknown to the user. Tracking software and potentially dangerous programs, which are often designed to hide themselves in startup locations. Many users have reported frustration with increasingly longer startup times—the longer they have had their PCs, the longer the PCs take to start. iolo Labs undertook a study designed to measure whether startup time lengthens over a period of time and, if so, what factors may contribute to this impact. The study was designed to measure changes over time by observing machines ranging from a brand‐new PC to one that was in use for two years (reported as the average lifetime of a computer). 0 month — A PC that simulates the typical state of a computer that is either brand‐new or recently had its operating system installed. 3 month — A PC that simulates the typical state of a computer that has been used for three months. 6 month — A PC that simulates the typical state of a computer that has been used for six months. 24 month — A PC that simulates the typical state of a computer that has been used for twenty‐four months. Created and tested using commercial virtualization software. Based on the machine class “Home Office.” At the time of testing, a “Home Office” class was defined with the following configurations: 32‐bit Windows XP operating system, 2 GHz CPU, and 1 GB RAM. Installed with the latest version of a 3rd party internet security product. Verified to be free of parasites, such as viruses, adware, spyware, and other malicious software. Windows startup time is the length of time it takes for a PC to completely start up. Startup time was measured from when the PC is powered on to when the CPU reaches its minimum average idle state (when the average deviation in CPU usage percentage has stabilized). iolo Labs used a proprietary formula to capture when this usage percentage has stabilized. Startup tasks are the programs and services that Windows loads at boot‐time. Unnecessary startup tasks are those identified in the iolo Labs tune‐up database as automatically opening programs that are not essential to the normal operation of the PC. The purpose of these “unnecessary” tasks is typically to provide quick access to programs that are not usually needed at startup. 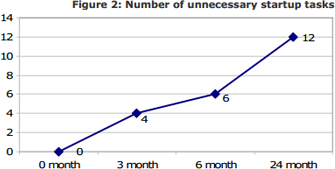 As shown in Figure 2, after 24 months, the number of unnecessary startup items grew from 0 to 12. CPU usage is the amount of time the CPU spends processing user applications and high‐level Windows functions. The startup impact on CPU usage is measured by the percentage of increased CPU usage caused by unnecessary programs that are begin loading after the Windows shell is in memory, until the time all of these programs have finished loading. For example, if the maximum CPU usage during post‐shell startup with no unnecessary programs is 10% and a collection of unnecessary startup programs are introduced that represent a 47% startup impact, the total sustained average CPU usage during post‐shell startup becomes 57%. Figure 3 shows the portion of CPU utilization consumed by unnecessary startup tasks. 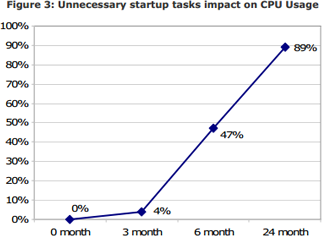 At 24 months, the majority ‐ 89% ‐ of the CPU usage is due to the impact of unneeded startup tasks. The impact of unnecessary startup tasks sharply increased, accounting for 89% of the CPU usage. Clearly, progressively slower PCs are not the result of “age.” Something can be done about it. 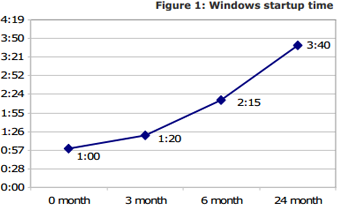 By reducing the number of unnecessary startup tasks, the amount of time it takes for Windows startup processing can be reduced and the impact on CPU usage can be significantly reduced. /content/uploads/iolo_logo-20-anniversary-white.png 0 0 Edgar Chacon /content/uploads/iolo_logo-20-anniversary-white.png Edgar Chacon2018-02-22 01:12:542018-04-05 18:03:45Can Your PC Start Up Faster?